One of my favorite aspects of travel is the people you meet from all over the world and experiences you share together. I've found that guests at Hotel Il Perlo not only have a similar love of travel and cycling, but they also value how welcome you are in the local community by finding a way to give back. I met Robert and his wife Libby from Melbourne in the fall of 2015 bonding over breakfast and bike rides. I knew I found a kindred spirit in Robert when he was fully game to ride to the Muro di Sormano in cold pouring rain while the Italians stayed indoors and called us pazzo. Well, yes we wouldn't deny that and we've stayed in touch ever since. Robert and Libby just finished a long holiday in Italy, luckily coinciding with the Giro d'Italia! 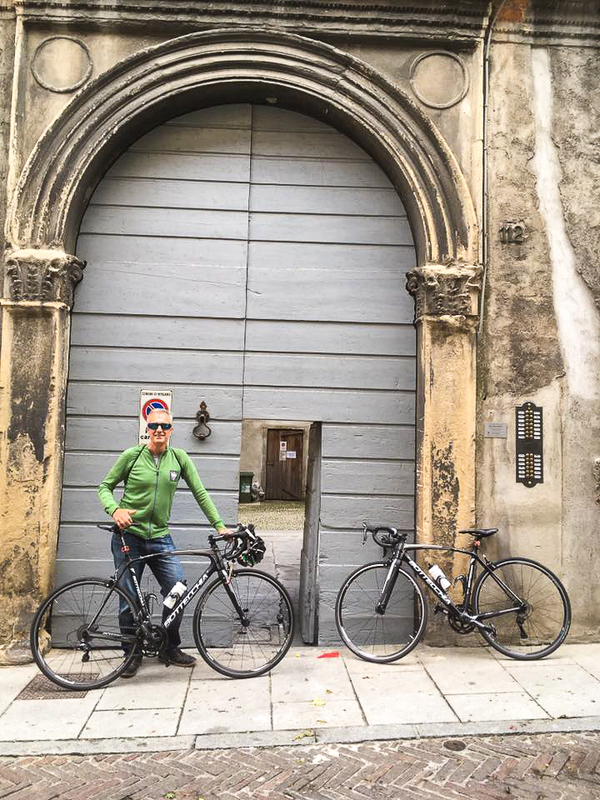 Robert was nice enough to write up some of his experiences riding in Bergamo and Lake Como, and his interactions with the Community Casa Don Guanella. As Hotel Il Perlo and ComoLagoBike prepare for the Grandfondo Don Guanella on October 8 this is a great introduction to the project and a story of how guests to the area become part of the community. Grazie Roberto! We do stupid things: riding to and up the Muro di Sormano in the cold rain, October 2015. Photo by Pez. We do stupid things: the wringing of the gloves, October 2015. Photo by Pez. We do smart things: stuffing 2 bikes and soaking wet riders into a small Italian rental car instead of getting hypothermic descending the Colma and riding back, October 2015. It is the morning of Stage 15 of the 100th edition of the Giro d'Italia and I am in the beautiful medieval hilltown of Bergamo just southeast of Lake Como. I have set out on my Bottechia Italian carbon fiber bike, rented from ComoLagoBike, to climb the Selvino. This local 10 km climb with 18 switchbacks will be descended by the Giro riders later in the day. Without a guide and unsure of the best way to the start of the climb, I see another cyclist. "Ok you not Italian." he says. I ask again "Via Selvino?" "No" he replies and indicates that he is due for a flat ride, but is happy to show me the direction. We ride a few more kilometres chatting in broken Italian and broken English. Then he asks how long am I riding today. "Circa 4 ore," I reply. He says "Ok, I make you a beautiful tour, we go to Selvino and 2 other climbs with better panorama." "Yes, it is best," he replies. Sweet Bottecchia bikes from ComoLagoBike delivered to Bergamo. Italians love it when you are passionate about cycling! What a tour we had! Tough climbs up the Selvino, Salmezza and Miragolo, stunning scenery, great company who made sure we had the right coffee stop and were back in time to take up a prime spot to watch the Giro come into town that afternoon. How could I beat that day? This is why I like to travel, especially to Italy and when I do I try to look for the positives and usually find good experiences as a result. It is easy to get down if things are not as they are at home.... shops closed after lunch, crowds and traffic chaos, or getting lost with no street names. Try chilling with a Almond Granita or a Caffè Shakerato, get on the bike, have fun exploring, getting lost and maybe make a new friend. I had heard of the Ghisallo climb and the Madonna del Ghisallo chapel from a cycling buddy in Australia who had been there on a driving holiday and had always dreamed of returning on his bike. When I made my first visit to the area 2 years ago and stayed at Hotel Il Perlo Panorama, turns out that the hotel is situated just above Bellagio on the Ghisallo climb! So I made it there to ride before my buddy, and found out why it was his dream. When it comes to cycling, Carlo, the owner of Il Perlo, and the staff from ComoLagoBike make it easy. Il Perlo is family run and you can tell. They form a bond with you and the passion for the area and care towards the guests is evident. While staying at Il Perlo I was especially intrigued by the young migrant waiter who spoke broken English and broken Italian, but just wanted to please. Boktor was from Egypt and his story was probably similar to thousands we see in the news. When I inquired, Carlo told me of the programme that his friend and cycling priest, Don Agostino, had put together through the Community Casa Don Guanella in nearby Lecco. Youths at risk, both migrant and local, came to them via the Justice Department and are supported, orientated, schooled, trained, and then through "Il Don's" network of friends given work and hope. I got to meet Don Agostino and although we had trouble communicating I could sense his compassion and commitment. I wondered if I could help in the future. The Casina Don Guanella farm overlooking Lecco. In planning for this trip I harboured the idea of visiting the Community Casa Don Guanella, but didn't know how to best organize a way to see it. In the meantime a couple of yard sales at home raised a few hundred euro to donate if the chance arose. On talking up my return to Lake Como and Il Perlo, my Australian "Ghisallo dreaming" friend could not miss this opportunity to finally go. So this May we met at Il Perlo, and with the guides from ComoLagoBike, we made some incredible rides through the Valvarrone and Valsassina valleys, over the Passo del Agueglio, up the switchbacks to Monterone (the smallest town in Italy) and of course the pilgrimage up the Ghisallo and the Muro di Sormano climbs, then cruising round the lake or a ferry ride back to Il Perlo. On return we were greeted by Carlo's excited face awaiting our ride reports with lunch ready outside on the patio. My favourite after ride activity was walking to the beautiful stream behind the hotel to cool the aching legs. The area is filled with amazing walking trails, but beware they are steep and you're guaranteed to get lost. No sweat, that is the idea and a local will point you home. Overlooking Lake Como and Bellagio from Agueglio. A cyclist's dream at the Ghisallo. Post-ride soak in the creek behind Il Perlo. An unexpected surprise was how wonderful to see Boktor still working 2 years later at Il Perlo, now as a head chef with perfect Italian and improved English. Complimenti Carlo! Inspired, and with Carlo's help, a visit to see Don Agostino and the Community Casa Don Guanella in Lecco was quickly arranged. We visited the Casa where, proudly and graciously, Don Agostino gave us a tour and showed us the amazing art works the children produced and sold. Great, Christmas shopping done!! We had the privilege of accompanying him and his fellow priests in prayers. Not being Catholic was no barrier for feeling the sincerity and spirit governing the works of the Community. The next day we also visited the associated farm on a hill above Lecco where the students learned skills in horticulture, irrigation, farm animal management, viniculture, and more. Don Agostino has great ideas and amazing supporters, such as Tour de France winner and fellow Aussie, Cadel Evans. Imagine my shock when Don Agostino rings Cadel and hands me the phone for a chat! We both sang the praises of Don Agostino, and Cadel offered to try and ride with us if we return. You can be sure I will! The terraced gardens at the Don Guanella farm. Cadel Evans is a huge supporter of Don Agostino & Casa Don Guanella. Don Agostino, Carlo, and the staff of ComoLagoBike are organizing the Granfondo Don Guanella on October 8, 2017, which Cadel and other past cycling legends support and will be attending. I hope to put it on my calendar one year. Grazie mille Carlo and Don Agostino. A prossima volta!